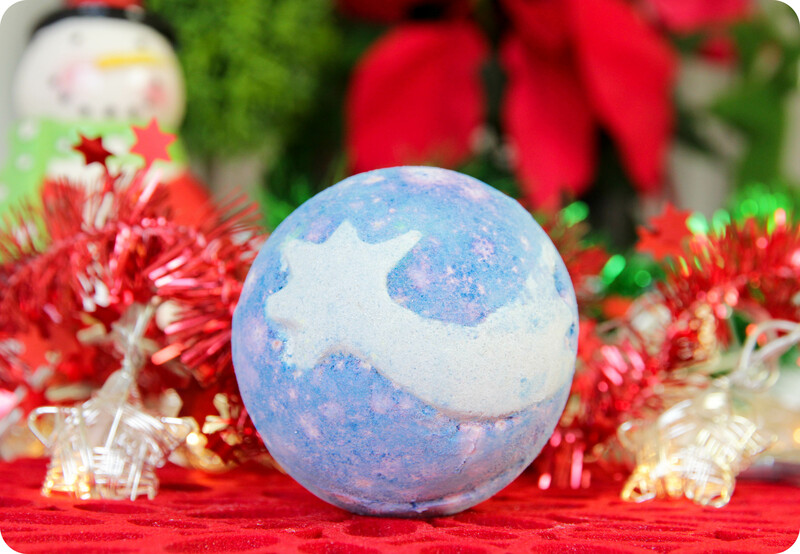 Probably not the most Christmassy-looking bath product ever created but Shoot For The Stars Bath Bomb made it into my LUSH basket nonetheless. I think it was mostly because I was on a LUSH-induced ‘high’ adding most of the Christmas collection products to my basket. I probably wouldn’t have picked it up under normal circumstances, the shape and colours of this Bath Bomb just don’t grab my attention (especially not for Christmas). What do you think? Shoot For The Stars is a Bath Bomb, that means is makes bath time super fun – even if you’re a 31-year-old like me. It is adorned with a silver-ish shooting star on the one side, and a yellow shooting star on the other. Specks of pink and flecks of silver shimmer are also scattered all over the body of Shoot For The Stars, which should probably remind me of a starlit night-sky but it’s actually resembles a daylight sky instead. Don’t let the average-looking outer shell of this bath bomb fool you, though…it’s absolutely marvellous in the bath! Once it hits your bath water, you’re in for a visual treat! Shoot For The Stars has a mouth-watering honey, toffee scent – it is the scent-sister of LUSH’s Honey I Washed The Kids soap. Deeeeelicious! It contains refreshing Brazilian Orange Oil and uplifting Bergamot Oil to leave the skin feeling silky soft and nourished. Some LUSH Bath Bombs moisturise the skin more than others, and Shoot For The Stars is definitely one of the more moisturising ones. Drop this magic orb in the bath and prepare to be mesmerised. You’ll soon realise this is one of LUSH’s slower fizzing Ballistics, which I personally didn’t mind because I was in absolute awe of it. Despite its dissolving speed, it starts to fizz and bounce around immediately, turning the water an enchanting shade of blue. It then spins slowly creating swirls of blue, pink, yellow, purple and silver – almost like an Aurora Borealis show right there in my bath tub. The silver shimmers look like little shooting stars and small white moisturising stars are also scattered about, creating a soft haven of twinkles. Once you sit back to relax in the bath, it’s almost like a fairy or unicorn (whichever tickles your fancy) has created a magical, midnight-hued bath just for you. The silver shimmers dance around in the water, ebbing and flowing as you move around in the bath tub. My explanation of the whole experience unfortunately doesn’t do it justice, I am sitting here writing this blog post with a heart rate of close to 200bpm – that’s how excited I get when I think about my bath last night! Once you resentfully climb out of the bath (the water was cold by the time I got out) and drain the bath water, do yourself a favour & run your fingers along the inside of the tub. I always do this whenever I use a shimmery LUSH product. It looks like a fairy exploded in your tub. Silver shimmers everywhere, it’s absolutely magical! As mentioned, the only downside to Shoot For The Stars is the fact that it doesn’t really look or smell Christmassy at all. BUT it did a marvellous job of entertaining me, leaving my skin feeling super soft & my bathroom smelling like a toffee dessert…so it’s all good, LUSH. It’s all good. Shoot For The Stars Bath Bomb retails for R 48,50 and is currently available in the LUSH online store, as well as in-store (Cavendish, V&A Waterfront, Canal Walk and Gateway). Lol! Heart rate of 200bpm! I completely agree with you that this is not the most xmas themed bath bomb but since it smells like Honey I washed the Kids I must have it! Ooh I like the look of this bath bomb! Cant wait to see what you feature tomorrow, Im hoping Lord Of Misrule, Golden Wonder and Xmas Hedgehog is also on your list of reviews. 😀 Thinking of splurging a bit at Lush when we go there next weekend. I want all of it!!!! Love the colours of the bath bomb! This is by far my favorite bath bomb and you are hilarious at explaining things!